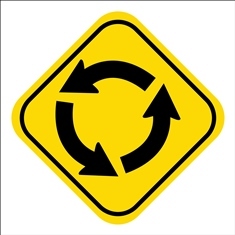 Roundabouts Can Create Confusing Traffic Patterns | Keller & Keller over the last two decades, and the Indiana Department of Transportation encourages municipalities to consider a roundabout for any intersection improvement project. The debate continues, however, as to whether these intersections are really the best option in many situations. A roundabout is a circular intersection where drivers travel in the same direction around a central island. A roundabout contains no stop signs or traffic lights, but depends on slower traffic speeds and yielding. As a driver approaches a roundabout, he yields to traffic already in the roundabout. When there is space, the driver enters the roundabout and continues around the circle until he reaches his desired exit point and can essentially travel unimpeded straight down that road. A roundabout can be constructed in various sizes, and they are typically classified as mini, single-lane, or multi-lane. Fewer accidents. The Federal Highway Administration states that compared to other types of intersections, roundabouts have 90 percent fewer fatalities and 75 percent fewer injuries. Roundabouts nearly eliminate the risk of head-on and high speed collisions. More efficient traffic flow. By design, a roundabout keeps traffic continually moving. There is less stop-and-go congestion to keep roads operating efficiently. Reduced gas consumption. Roundabouts keep the flow of traffic steady, which reduces the need to continually decelerate, idle, and accelerate. This can reduced both emissions and gas consumption for a vehicle. Lower operational costs. Once a roundabout is constructed, there is little need for intervention. Traffic signals require both energy and maintenance. Increased safety for pedestrians and bicyclists. With the lower speeds that accompany a roundabout intersection, the injury risk to pedestrians and bicyclists is reduced. Drivers have more time to both spot and react to others on the roadway. Additionally, roundabouts can be configured to offer paths for both pedestrians and cyclists. Slow moving traffic. Roundabouts force drivers to slow down their vehicles to safely traverse the intersection. While increases safety, it also can increase the congestion on the road during peak traffic hours. Vehicles can be forced to line up to enter the roundabout. Driver confusion. Some drivers find roundabouts intimidating and confusing. Even with the proper signage, many drivers are unsure about how exactly a roundabout operates and can find themselves in the incorrect lanes. This can result in accidents. Difficulty for emergency vehicles. When traffic is heavy and vehicles are waiting to enter the roundabout, there is little space for emergency vehicles to go around. They may get stuck in the line of vehicles, unable to proceed. Roundabouts do not reduce all risk from intersections. These problems and others can occur. Additionally, a roundabout cannot eliminate accidents completely. Accidents do still happen even with the safety features of a circular intersection. These types of accidents can result in property damage, as well as injuries large and small that can affect a victim’s life for years to come. If you or someone you love has suffered injuries in an accident in a roundabout, you may be eligible to file a claim. Contact the experienced car accident attorneys at Keller & Keller at 1-800-253-5537 to learn more about your rights.